By day a pastry chef, by night an accidental super sleuth. Three fun cozy mysteries from USA Today Bestselling Author Stacy Alabaster for one low price! Rachael is a distinguished pastry chef who keeps finding herself in the middle of murder investigations. Pippa is her quirky, carefree best friend. Together, they must unravel three more of Belldale’s unsolvable mysteries to save the bakery…and themselves. 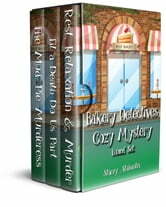 This collection of cozy mysteries includes books four through six in the Bakery Detectives Cozy Mystery series. If you like fast paced mysteries full of quirky characters and unexpected twists, you’re going to love the Bakery Detectives. 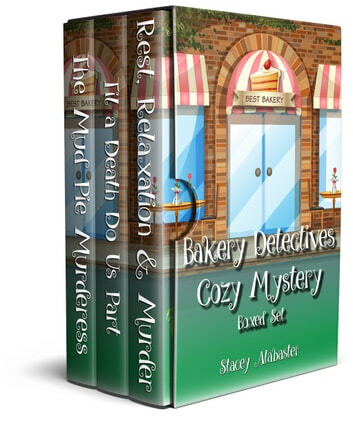 Buy the Bakery Detectives Cozy Mystery Boxed Set and start solving your next mystery (or three) today! Rest, Relaxation and Murder - A vacation ruined by a suspicious death. A mystery no one seems willing to solve. Rachael and Pippa are the only ones who can save the resort…in more ways than one. Til a Death Do Us Part – Nothing ruins a wedding faster than a dead body. The Mud Pie Murderess – Rachael is struggling to keep the bakery afloat while Pippa is sidelined with a mysterious illness. When a woman is poisoned in her bakery, things look bleak for the Bakery Detectives.